Soprano Laser hair removal method uses groundbreaking technology to offer a simple, one-stop solution for truly effective hair removal. 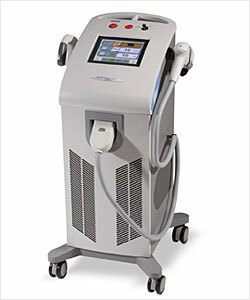 Soprano Laser unique gradual heating method effectively damages the hair follicles while avoiding injury to the surrounding skin. Soprano Laser sweeping In-motion TM delivery technique keeps the laser in constant motion ensuring full coverage. This machine uses simultaneous contact cooling prevents burns and allows for a more comfortable treatment.With receiving treatment using this machine you will face minimum side effects on your body. Also it specialized applicator allows you to treat large areas in less time. This method of treatment can save time by getting a life time result. Whether you have light, dark or tanned skin, coarse or fine hair, Soprano laser is the best solution to achieve maximum results for all areas of the body with treatments that are safe, quick and best of all virtually painless. Just imagine, in three months, no more shaving, plucking, or waxing. According to a recent survey completed by patients, 8 out of 10 were very happy to report that the treatment was virtually pain free.Patients satisfaction from receiving this method of treatment is known to be in high rank.